Last Week in Review: Markets were volatile after the election, with Stock markets surging at the expense of Bonds. Forecast for the Week: Will inflation continue to edge higher? The Fed wants to know. View: You can say no and still preserve a relationship. “Hey, we’re headed for the future.” Neil Diamond. As Americans went to the polls to exercise their right to vote for president, global markets took notice. When Donald Trump was declared president elect, the market reactions overnight were as wild and unpredictable as the election itself. Dow futures were down more than 800 points in the wee hours of the morning, only to close up 250 points Wednesday. Further, the Dow Jones Industrial Average opened Thursday at a new all-time high. Investors may feel the win is more Stock-market friendly with potential tax cuts, deregulation of banks, and higher defense and infrastructure spending. There is also speculation that President-elect Trump’s anticipated policies could spur a rise in inflation. Rallies in the Stock markets and inflationary increases both can have a negative effect on Mortgage Backed Securities, the type of Bond to which home loan rates are tied. In other news, weekly Initial Jobless Claims continue to signal a robust job market. The Labor Department reported that the number of Americans filing for first-time unemployment benefits fell 11,000 to 254,000 during the week ending November 5, below the 262,000 expected. 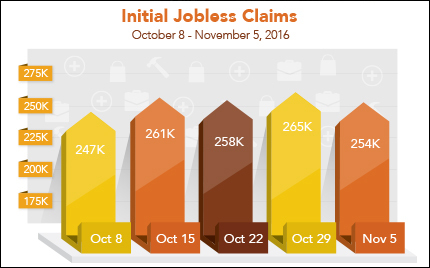 First-time claims have now remained below the 300,000 mark for 88 consecutive weeks, a stretch not seen since 1970. For now, home loan rates remain attractive despite edging higher recently. Inflation, housing and manufacturing reports will stand out in this data-rich week as the Fed gears up for its Federal Open Market Committee meeting in December. The Retail Sales report kicks off the week on Tuesday. Regional manufacturing data comes from the Empire State Index and the Philadelphia Fed Index on Tuesday and Thursday, respectively. Inflation metrics will be shared in the Producer Price Index on Wednesday and the Consumer Price Index on Thursday. Housing market data is plentiful starting with Wednesday’s release of the NAHB Housing Market Index followed by Housing Starts and Building Permits on Thursday. As you can see in the chart below, Mortgage Bonds took a dive recently following the presidential election. Bond markets were closed Friday, November 11 in observance of Veterans Day. Gather key details. Listen to the request carefully and ask questions. Also, thank the person for considering you to handle the request. Listen to your gut. If something inside you is saying no — whether due to time, resources or the request simply isn’t within your scope of work — it’s probably the right response. However, if you prefer time to really consider the offer, explain that you need to check your schedule. Then, formulate your response. Offer alternatives. If you ultimately decide the opportunity isn’t right for you, or it’s one you can’t handle in the necessary timeframe, don’t be afraid to say so. Also offer alternatives that might work for you, such as a different deadline or other idea if appropriate, which the other person may not have thought of. Make connections. Just because you can’t handle a request, doesn’t mean you don’t know someone else who might be a great fit. Facilitate a referral. This shows you are empathetic and willing to help, and also that you value the person’s needs ahead of closing a deal. Be personal. Facilitate referrals personally with a phone call, face-to-face introduction or email to the referred party letting him know why you are making the referral. This will establish your professionalism and credibility as well as a clear track record of your service mindset. Saying no the right way can be an opportunity to show your professionalism and willingness to help your clients and contacts, which in turn can strengthen your relationships in the long term.